Operating up to a 33,000-pound gross vehicle weight rating, the model was created in response to the growing demand for a propane autogas-fueled, medium-duty chassis for bobtail applications, cylinder delivery trucks and larger tank setters and box trucks, the company says. 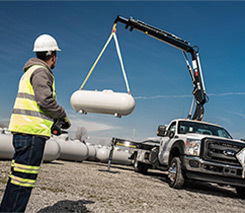 Michigan’s Victory Propane, which has already deployed Ford F-650s fueled by propane autogas in its fleet, will have 15 Ford F-750s by the end of this year. These trucks will be equipped with 3,200-gallon barrels. The Ford F-750 base model comes with a single-saddle, 45-usable-gallon fuel tank located on the driver side for ease of fueling. Two dual-tank options are available: the dual short tank with 45-usable-gallon capacity and an extended range option with 70-usable-gallon capacity. Each Ford F-750 equipped with Roush CleanTech’s propane autogas fuel system will emit about 120,000 less pounds of carbon dioxide over its lifetime compared to conventionally fueled counterparts, the company adds. Built on Ford’s 6.8-liter V10 engine, the vehicles meet Environmental Protection Agency and California Air Resources Board certification requirements, the company notes. 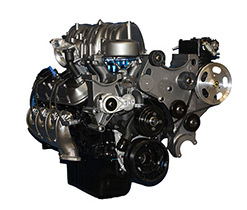 As a Tier 1 supplier and Ford Qualified Vehicle Modifier manufacturer, Roush CleanTech says it makes propane autogas vehicles that retain all quality Ford performance characteristics, such as horsepower, torque and towing. Roush CleanTech maintains the factory Ford five-year/100,000-mile or 4,000 hours limited powertrain warranty on vehicles equipped with its propane autogas system. 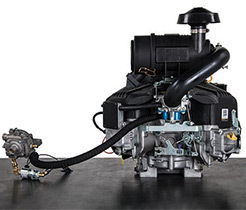 The propane autogas fuel system is covered by a limited one-year/12,000-mile warranty when installed on a truck that is no longer covered by the Ford factory warranty. 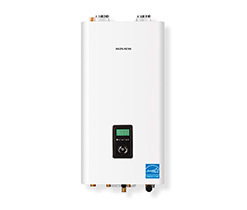 The product is available in model year 2016 and newer. 2 Comments on "Ford F-750 meets need for propane delivery vehicles, box trucks"
Will these trucks have air brakes? David – No, these trucks will have hydraulic brakes.